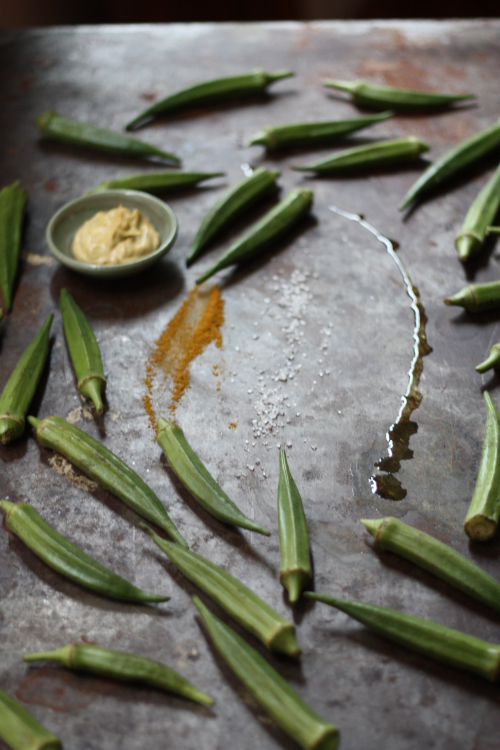 You or someone you know might have a preconceived notion about okra — slimy, chewy, and simply inedible? 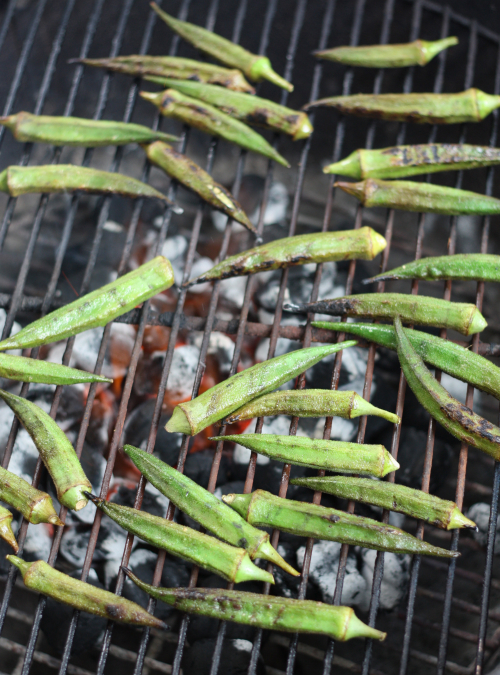 Talk to any longtime okra fan and you'll find that when tossed straight on the grill with a little sea salt and olive oil, just about anyone will have a change of heart about this late summer vegetable. Add a little curry aioli and they might just be planting some in the garden next year. Most can deal with fried okra and this is a great healthier alternative! Rinse okra and pat dry. For the aioli simply mix 1 tablespoon of curry with 3 tablespoons of mayonnaise. It should turn to a yellowy mustard looking dip. Cool in the refrigerator while we prepare the okra for grilling. 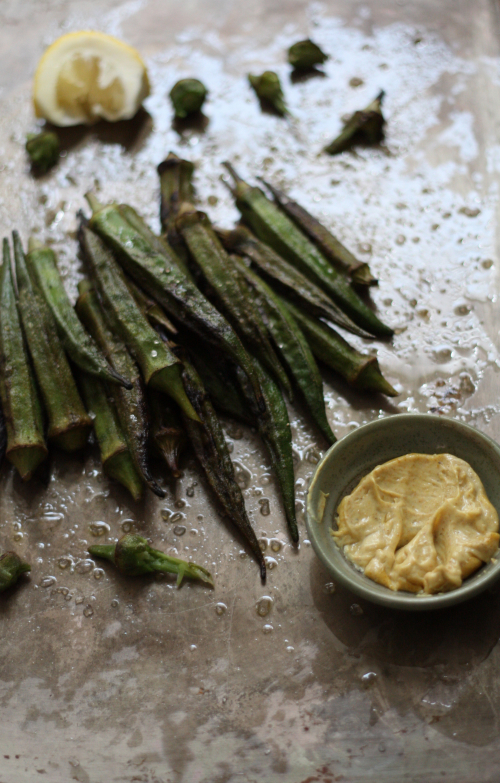 On a sheet pan or cookie sheet drizzle the whole okras with olive oil and sprinkle with salt. You can even dust with a little bit of curry at this stage if you like. 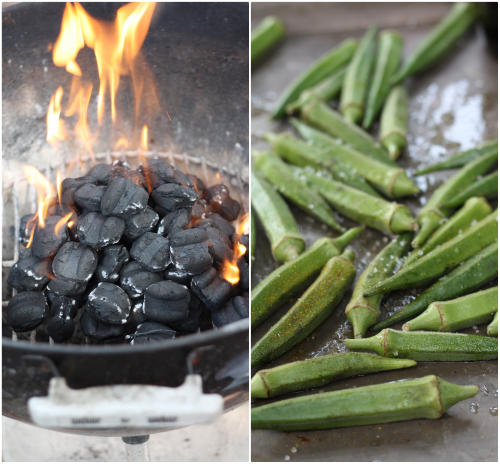 Once the grill is ready at medium heat, place the okra directly on the grates and keep an eye on them, turning frequently. Keep an eye on the smaller ones so they do not fall between the grates. Fortunately, I only had one casualty with this batch! Straight from the grill, squeeze a fresh wedge of lemon and you are ready to dive into that curried aioli! Okra is about at the end of the season, although you should see some at your farmers market again this weekend. 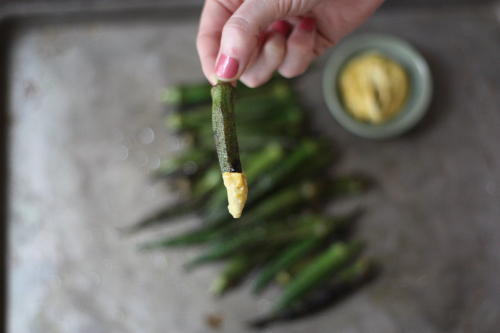 Run, don't walk — you gotta try this, okra fan or not! 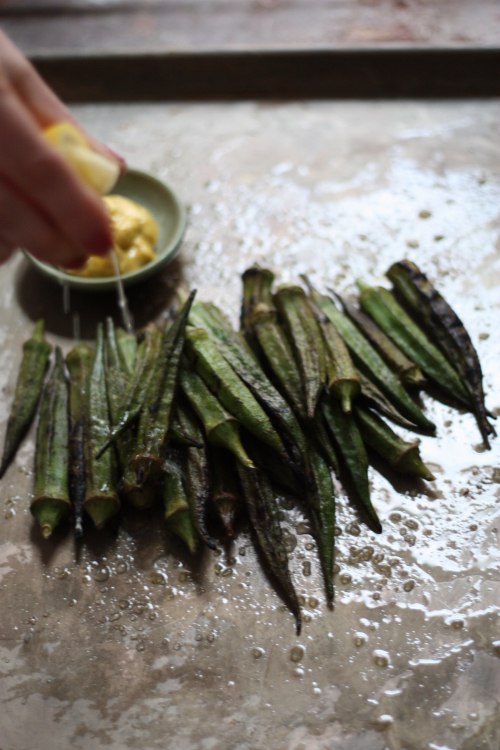 Grilled Okra is amazing. You can get a similar effect roasting it in the oven too. These sound awesome! I had a pickled one in a bloody mary once and it totally changed my perspective on okra! I love a spicy okra in my Bloody Mary!